When Homer is 11 years old, The Captain retires, and Homer Sr. takes his job. Homer Sr. moves his family into The Captain’s house, which is larger and more comfortable than his previous house. Reflecting on his family, Homer notes that Jim never liked him much. It’s possible that Jim blames him for causing tension between their parents, as Elsie had wanted to have a daughter, but ended up with Homer. From literally the beginning of his life, Homer is unwanted—Elsie wanted a girl, not a boy, and Homer Sr. prefers Jim because of his talent at sports. This reminds us that life in Coalwood is intensely gendered—men are expected be interested in football and mining—so Homer will be fighting the status quo if he tries to pursue something different. In 1957, Homer begins high school at Big Creek. He likes the new environment, and appreciates that he’s still going to school with his closest friends, Roy Lee, Sherman, and O’Dell. He notes that the key “milestone” in his life happened on October 5, 1957. Hickam builds some suspense in this section, not telling us what the “milestone” in Homer’s life will be, but setting up the start of the plot. On Oct 5, Elsie calls Homer to the radio and tells him to listen. The radio announces the launching of Sputnik. Elsie asks Homer what this means. Homer knows exactly what Sputnik is: a Soviet satellite that orbits the planet and measures the weather. Elsie nods and says that this news will infuriate Homer Sr., a loyal Communist-hater. Homer Sr. often argues with Elsie’s brother, “Uncle Ken.” Ken is a loyal Democrat, and Homer is an equally fierce Republican. Rocket Boys takes places at the height of the Cold War, when the United States was locked in a tense standoff with the Soviet Union. Like the Hickams, there were millions of American families who were raised to despise Communists, “Red” culture, Russians, and socialism—and many still do. News of Sputnik spreads through Coalwood quickly. Shortly thereafter, Homer takes the bus to school with Jim. Jim, Homer notes, is a well-dressed, popular boy. Homer and Jim fought one another hundreds of times growing up. Recently, they had an especially brutal fight regarding their bicycles, and as a result Homer sustained a purple welt on his leg and his ribs ached for a month. Since that time, Homer and Jim haven’t fought or even talked. Homer and Jim’s relationship is a kind of “Cold War” all its own: they’re not actively fighting with each other, but they’re far from friends, and delight in irritating each other in various little ways. It is the first day of school after the launch of Sputnik, and Homer rides the bus. He sits next to Linda DeHaven and Margie Jones, with whom he’s gone to school since the first grade. He notices his friend O’Dell, who’s sleeping on the bus. He also sees Sherman, an intelligent boy with a shriveled leg as a result of a polio infection. There is also Roy Lee, a good-looking, likable boy who owns a car. Homer is lucky to have these friends, he thinks, because he’s the target of much resentment. Because his father oversees the mine, many of the miners resent him. On several occasions, Homer’s friends have had to protect him from bullies. Homer is surrounded by girls his own age, but he’s evidently too shy to talk to any of them. Homer’s close male friends “have his back”—they allow him to pursue his own interests and be himself without having to worry too much about being bullied or attacked—yet Homer is still punished for his father’s deeds (even if these only consist of Homer Sr. doing his job). At many points, Homer’s mistakes and actions will cause Homer Sr. stress and anxiety—but it goes the other way as well. The bus to school drives past neighboring towns. There is Caretta, owned by the same mining company that owns Coalwood. Many of the miners in Caretta hate Homer Sr. for taking The Captain’s job. There’s also Premier, a “red light” area where prostitutes hang out. The next area is War Warrior, a decaying old town that never recovered from the Great Depression. Just as Homer is surrounded by adults who failed to escape Coalwood, so Coalwood itself is surrounded by “failed towns”—towns that wore out their mines and were abandoned. There’s something grotesque about living in such close proximity to failure, like growing up in a graveyard. When Homer arrives at school, everyone wants to talk about Sputnik. Many of the students think that the Soviets stole the design for Sputnik from U.S. scientists. They gossip about the U.S.S.R. and suggest that Russians eat their own babies. As Homer and Roy Lee talk, they compare homework. Homer notes that he was a poor student, especially at algebra. It’s something of a surprise to learn that Homer isn’t good at math—it seems obvious that being good at algebra is a prerequisite for building a successful rocket. This reminds us that Rocket Boys is a “coming of age” story, and Homer has a long way to go. Homer’s first class is biology. Over the intercom, the school principal, R.L. Turner talks about Sputnik, and suggests that the students concentrate on their studies in order to compete with the Soviet Union. Homer exchanges glances with Dorothy Plunk, who seems frightened by the prospect of a Soviet satellite. Homer whispers to Roy Lee, asking if he thinks Dorothy will go out with him. Dorothy’s friend, Emily Sue Buckberry, overhears them, and snaps that Dorothy already has boyfriends. Like nearly everyone in high school, she calls Homer “Sonny.” Homer blushes, thinking that he’s only kissed one girl in his life—Teresa Anello. He has a big crush on Dorothy Plunk. One of the most important legacies of the Cold War for American society was its influence on the educational system. The federal government pumped billions of dollars into math and science classes because it knew that it had to produce the next generation of engineers and physicists to compete with the Soviets. One of the major consequences of this change was that math and science became “cool”—or at least cooler. A few days later, Homer is spending time at the Big Store. The locals are talking about high school football, which is a huge part of Coalwood town life. Homer’s brother, Jim, is a talented football player, and Homer Sr. serves as the president of the Big Creek Football Father’s Association. Homer Sr. is exceptionally proud of Jim’s athleticism, to the point that Elsie suggests that he isn’t proud enough of Homer. Homer, who’s nearsighted and physically weak, has no interest in sports whatsoever. There’s an obvious conflict between the bookish, physically weak Homer, and the athletic, popular Jim. In part, this is a conflict for love and attention from the stern, stoic Homer Sr. It’s interesting that Homer tries to use engineering and science to earn his father’s respect at a time when the entire country was beginning to pay more attention to these disciplines: what happens in Homer’s house mirrors what’s happening in the country. Over the course of the next few weeks, the newspapers are full of stories about Sputnik. Homer is fascinated by these articles—he reads about the great German rocket scientist, Wernher von Braun, who’s working for the United States to build American satellites. He also reads that Sputnik will pass over West Virginia soon, low enough that people will be able to see it at night. Von Braun’s influence on American rockets is undeniable—somewhat ironically, since he began his career as a head scientist for the Nazis. For an impressionable boy like Homer, however, he’s nothing less than a national hero, and a worthy figure to aspire to work beside. The night that Sputnik is said to be passing over West Virginia, Homer goes outside, accompanied by his mother and his friends. Homer Sr. arrives, incredulous that a Soviet satellite is flying over American territory. Suddenly, O’Dell sees a bright object flying through the sky. It is a small, bright ball, which disappears from view in less than a minute. Homer is astounded by the sight. He can barely sleep that night, because Sputnik has excited him so much. To the seasoned adults of Coalwood, Sputnik seems like a threat. This isn’t an unreasonable reaction to the satellite: Sputnik is a Soviet object, and Americans in the 1950s certainly had valid reasons to fear the Soviets. At the same time, Homer interprets Sputnik as an invitation: an invitation to study science and engineering. It’s as if he’s too young and optimistic to react to Sputnik with fear and paranoia. On November 3, the Russians launch Sputnik II, which carries a dog named Laika. Soon after, Homer reads an article in Life Magazine about how Wernher von Braun built rockets when he was a child. Inspired, Homer decides to launch a rocket of his own. The principle is simple: put fuel in a vertical shaft, and create a hole so that the fuel can push out. Homer decides to use the powder from cherry bombs as his fuel. Homer’s first attempt at a rocket might not sound very sophisticated, but at least it proves that he’s following through in his ambition to study rockets. Even as a novice, Homer displays some impressive resourcefulness and willingness to take risky experiments. Homer gathers his friends, Sherman, O’Dell, and Roy Lee, to help him launch a rocket outside his house, near Elsie’s prized rose-garden fence. He builds the rocket using an empty flashlight tube, and punches a hole in it using a nail. Together, he and his friends fill the flashlight with cherry bomb powder, connect it to a fuse, and light the fuse. There is a bright flash, and Elsie’s rose-garden fence, burning, shoots up into the air. Elsie’s rose-garden fence is the first casualty of Homer’s love for rocket science. While this is probably an irritation to Elsie, Hickam presents this scene as comical—with the explosion of the rose-garden fence as the “punch line” of the joke. Arn, Jackson. "Rocket Boys Chapter 2: Sputnik." LitCharts. LitCharts LLC, 20 Nov 2015. Web. 25 Apr 2019. Arn, Jackson. "Rocket Boys Chapter 2: Sputnik." LitCharts LLC, November 20, 2015. 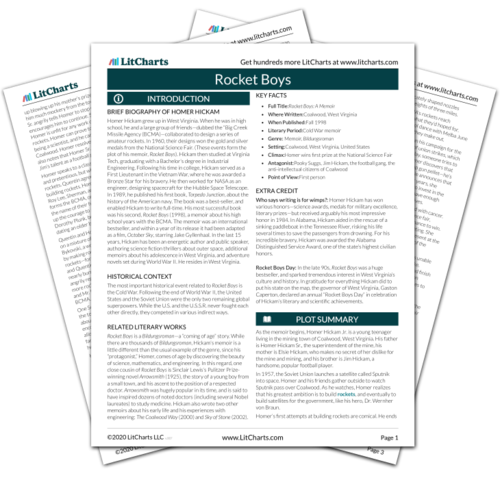 Retrieved April 25, 2019. https://www.litcharts.com/lit/rocket-boys/chapter-2-sputnik.